There were a couple times this weekend where it seemed like the Yankees' fortunes against the Red Sox this season might finally be changing: They won the series opener, for instance, knowing that they had an advantage, on paper, at least, in the starting pitching match-up for the following afternoon's game. Or during the series finale last night, when Brett Gardner's seventh-inning home run put the Yankees ahead, 2-1, and Rafael Soriano and David Robertson protected that lead, turning the ball over to Mariano Rivera. But CC Sabathia was lousy on Saturday, Rivera allowed the tying run to score last night, and Josh Reddick's game-winning hit off Phil Hughes meant yet another series win for Boston. Headlines like this one from Saturday — "Feels like Yankees have upper hand in rivalry with Red Sox" — seem kind of premature now, don't they? Friday night's win looks all the more important now. As is, the Yankees have some things they shouldn't be pleased with: They lost another series to Boston, and their ace continued to struggle against a team they could well face in the postseason. (Also: Bartolo Colon didn't last five innings on Friday, and his line would have looked a lot worse if not for Boone Logan; they squandered too many scoring chances on Saturday; and it's never pleasant to watch Rivera blow a save at Fenway Park.) But at the very least, this weekend didn't feel as lopsided as the previous couple of series. (After all, they needed extra innings in the rubber game to determine the series winner.) Brian Cashman had said last week that the Yankees had closed the gap on Boston, and that's true. But they've still got some ground to make up. 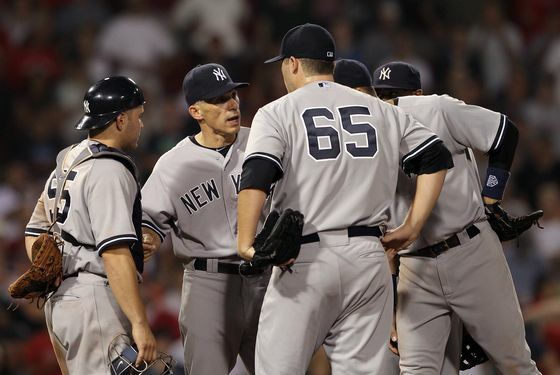 Of course, last night will also be remembered for something that didn't really involve the rivalry with Boston at all: It was the night Joe Girardi benched Jorge Posada, against a right-handed starter, and told the veteran that he didn't know when he was going to DH again. Last night, this meant that Eric Chavez served as the DH, but it could mean that the Yankees now have a spot in their lineup for Jesus Montero, though they'd still need to find a place for him on the 25-man roster. (Posada seems to have taken the news that he'd be out of the lineup entirely better than he took the news that Girardi had intended to bat him ninth back in May, also against Josh Beckett and the Red Sox.) The Yankees said that they don't intend to release Posada, so, at the very least, Yankees fans will have a chance to give their team's long-time catcher a proper send-off as the season winds down. Meanwhile, another decision was more or less made for Girardi last night, at least in the short-term. He'd already announced that Phil Hughes, who'd been scheduled to start on Tuesday, was available in the bullpen last night. And once the game went into extra innings, it gave him a reason to use the righty, opening up an opportunity for Ivan Nova to make another well-deserved start next week. (Had Hughes started Tuesday, it's uncertain what would have happened with Nova.) Of course, last night also complicates Girardi's decision: Hughes pitched poorly, and not only didn't he follow up his best start of the season with a strong outing, he also didn't give Girardi reason to be confident that he'd be able to slide back into a bullpen role, if that's how they eventually decide to use him. Both the Yankees and Red Sox are in great shape to qualify for the playoffs, which meant that this series didn't mean as much as it might have if they were battling for just one playoff spot. (For the record, we're fine with this: They have five and six more wins, respectively, than any other team in the American League. So they both deserve to play in the postseason. If that means an August series, or even a September series, lacks buzz, that's okay by us.) But the Yankees still have some decisions to make over the next several weeks, not only with regards to their starting rotation, but now with regards to their designated hitter. They'll next play Boston, by the way, on August 30, at Fenway.